Kids accumulate so many toys, that they can quickly take over their room. As adults, we know that that we need to get rid of stuff and can quickly discern what we should keep and those items we need to eliminate—by throwing them away or donating them. However, for a chid, this is different. These items are all that they own, so letting go of them can be very difficult. We live in a materialistic world. And, try as we might to not raise kids who are materialistic, they do become attached to things. And, although they mean something to them, we have to help instill values and help them realize what matters most are experiences and the people in our lives. 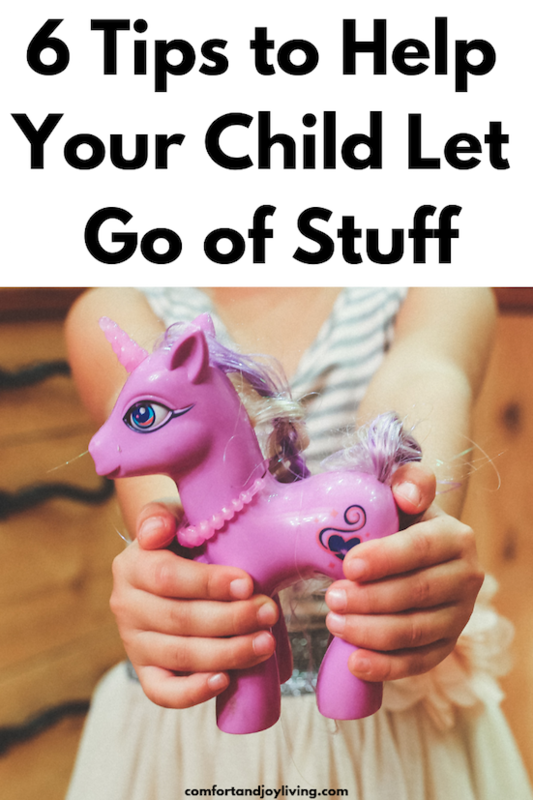 Here are some things that you can do to help your children learn to let go of their toys and treasures, while not being too emotionally challenging for them to do. 1. Talk about growing up. Have a talk with your kids about growing up and how it’s okay to let go of toys that they no longer play with. Explain to them that you are going to give them to other kids so that they will be able to have toys and stuffed animals to cuddle with at night. 2. Move items to a temporary place before getting rid of them. If your child isn’t ready to part with their items, give them a temporary home, outside of the bedroom. Have your child help decide which items they want to try to let go of. It can be difficult for them as getting rid of their toys means that they’re growing up, and they still want to hold onto them so that they can stay your little girl or boy. Place items in a box or bag and store them in the garage or basement. If your child doesn’t look for or ask for the items after six months, it’s okay to get rid of them. In most cases, kids will only ask for one or two toys, but you’re still able to declutter and get rid of quite a few items that they no longer use or need. 3. Let your kids sell their toys. Check out Amazon, eBay or Facebook Marketplace to find out if your child’s used toys can be sold. If you have a garage sale, you can have our kids set up their own table. Items such as LEGOs can be repackaged and sold for a good amount of money on Amazon—just make sure that you have the book and can account for every single piece. When your kids can sell their stuff and make money, they’re more willing to get rid of their things. Your child is in control of the items that are leaving and gets to turn their toys into money, which they can use towards other things that they may want. 4. Have them donate their items to charity. Teaching your kids about how other children may not have toys and clothes helps them learn empathy. They can relate to other children their own age that do not have items like they do. An easy way to help instill this value is to ask your child to select the charity where you will make the donation. You can research local organizations and your child can decide where the donation will go. When they get a say, they will be able to feel that they are making a difference and are also in control of the items that they’re parting with—rather than mom and or dad telling them what to do. They may even surprise you by getting rid of items that you didn’t think you’ve ever see the let go of. 5. Include them in the process. Whether you’re doing a big decluttering project and throwing or donating items, make sure that your kids are part of the process. Have your child go through and select their ten favorite toys and ten least favorite toys. When they see what you’re keeping and getting rid of they’re involved and are much more willing to let things go. There are some toys that you just don’t want to toss or donate. These may be a first stuffed animal, the truck that your son carried everywhere or the wooden toy that their grandfather made. Tell your child that you are saving them in a special box so that they can give them to their children when they grow up. Whatever you do, don’t force your child to get rid of their items. They will let go of their stuff in due time—and maybe even sooner then you may be ready for them to do so. Helping to teach your child about letting go of stuff is a valuable lesson, which will help them later in life. What tips do you have for teaching your child to let go of toys and other stuff?